Maybe you’ve been thinking about taking a boat cruise, but you’re not quite ready to deal with the hassle of a long trip to an island or other faraway destination. A smaller cruise is the perfect alternative to those fancier versions. Small boat cruises take you on short trips during the day or evening, and you have a lot more flexibility in planning. In fact, you can enjoy a luxurious combination land and water getaway right here in upstate New York. Skaneateles is a charming village that is nestled near pristine beautiful Skaneateles Lake. Coming here for a Finger Lakes vacation is like taking a step back in time when small towns were the norm. The village has a laid back vibe that is very welcoming to visitors. If you want a vacation spot to kick back and relax in relative obscurity, Skaneateles is for you. There are no maddening crowds and you have the freedom to stroll around town, easily mixing in with the locals. The lake is a main attraction for locals and visitors. Instead of settling for a cramped hotel with the same flat décor as countless others, a better alternative is to stay at one of several luxury vacation rentals in Skaneateles. When it comes to vacation rentals in the Finger Lakes, it is hard to beat those offered in this quaint village. If you truly want a quiet, peaceful home away from home experience, a luxury rental condo in town, or in a home near the lake, is the better choice. These homes have kitchens, living rooms and bedrooms that are cozy and spacious. You can hang out at home in complete privacy during your stay, going out when the mood strikes. Daily Skaneateles Lake sightseeing cruises are available throughout the day. The regular tour cruise is the shortest. This cruise is under an hour and offers languid viewing of serene waters and vintage houses dotted along the waterfront. There are two meal cruises. Both last longer than the sightseeing tour. The lunch cruise is around an hour and the food is quite good. Couples wanting to spend a romantic evening together on the lake can go on the dinner cruise. Indulge in an elegant meal while cruising along the lake for three hours. There’s no need to dress fancy, unless you want to dress to impress your mate. The two of you can snuggle on deck while watching the sun slowly go down before returning to your Skaneateles luxury vacation rental. There’s one more cruise that is really unique. The U.S. Mailboat cruise is a working boat cruise where you get to do some sightseeing while the mail is delivered to local homes. This is certainly an experience that you rarely get anywhere else in the country. It’s definitely an old-fashioned slice of life that is uniquely memorable. Start planning your Finger Lakes luxury vacation in Skaneateles right now by booking a luxury rental. August is finally here and you can escape the stresses of daily life and work. August is the last month to fully indulge in summertime activities. It’s also the perfect time to check out several Finger Lakes vacation rentals. Are you looking for a place to kick back and get some much deserved rest and relaxation? There are beautiful homes and condos in the charming village of Skaneateles available for visitors to our region. If you have never stayed in a Finger Lakes vacation rental, you simply must see what all the fuss is about. These spacious rentals have all the comfort of home, plus, the added advantage of being near a gorgeous body of water. Visitors yearning for that “I love New York” experience, find plenty to sing about while staying in the Finger Lakes. In addition to amazingly tranquil scenery, you’ll be able to enjoy the local entertainment. 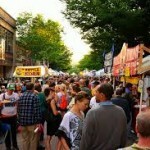 Come out and celebrate the awesomeness of sauerkraut at this fun-filled festival. At one time, Phelps was known as the sauerkraut capital of the world. In other words, there is no better place to enjoy all things sauerkraut. This free event features arts, crafts, contests, rides and, of course, delicious food and sauerkraut. Enjoy an adult night out at the Rosamond Gifford Zoo. This special fundraiser is for the consummate beer and wine lover. Taste regional beers, wines and food while tapping your foot to some great music. Attendees must show proof of being 21 years of age. Children, including infants and toddlers, are not admitted. Come to this savory festival and immerse yourself in the wonderful world of garlic. Local chefs are on hand to give cooking demonstrations and lectures on how to prepare and use garlic in various recipes. If you’re just interested in eating, the menu items featuring garlic will make your mouth water. You’ll also find local fresh produce, homemade goodies and crafts. The Nedloh Brewing Co. is sponsoring its very first Hopfest event. Anyone interested in learning how craft beers are developed and produced is welcome to come and enjoy learning in a festive atmosphere. Sample craft beers made from breweries in the upstate New York region along with hearty food. Bring the whole family to the Strawberry Fields U-Pick Hydroponic Farm for some good old-fashioned fun. Be prepared to eat delicious strawberry goodies along with other foods. Activities include a bounce house and live Alpacas. Homemade arts and crafts are also on display and best of all, we have Skaneateles Lake rentals right in the area. To get the most out of your upstate New York August vacation, reserve one of our Skaneateles lake rentals today and enjoy all of the amenities of home.